The vast majority of people on the earth consent to be a part of one of the 190 or so independent nations which are internationally recognized. But a very special few are not satisfied being subject to another government’s authority. Instead, they set out to found their own nation, which may be composed of little more than their own family and possibly a few devoted friends. Their territory may be no bigger than a tiny island and their claims may be purely theoretical. They may never receive recognition for their claims. And yet they soldier on, because the dream is too great and the stakes are too… low, actually. Today we honor Sealand, my favorite micronation. Sealand is a principality located six miles off the coast of southeastern England. It consists entirely of a naval fort from World War II which is no longer in use by the British government. Paddy Roy Bates, along with his family, claimed that it was an independent nation in 1967. He first took possession of the fort intending to create a pirate radio station, but he was brought into court when he fired on people who were sailing nearby. Strangely, the court case was thrown out because Sealand was actually located outside the U.K.’s territorial waters, which at the time had a limit of 3 nautical miles. However, the U.K. still refused to accept Sealand’s independence, even though it never ejected the Bates family from the territory. 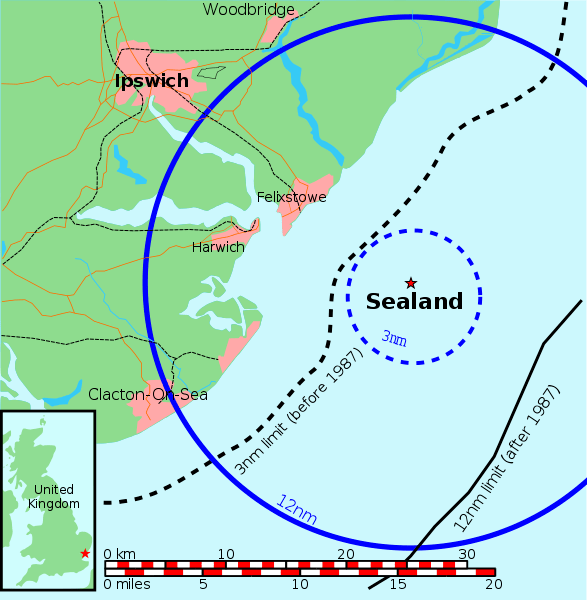 In 1987, though, the U.K. extended its territorial waters to 12 nautical miles, destroying Sealand’s tenuous claim to autonomy. Fortunately, the residents of Sealand have continued to live there without much hassle from the British authorities, even though Sealand is now completely within the U.K.’s waters. Map of Sealand and the United Kingdom. 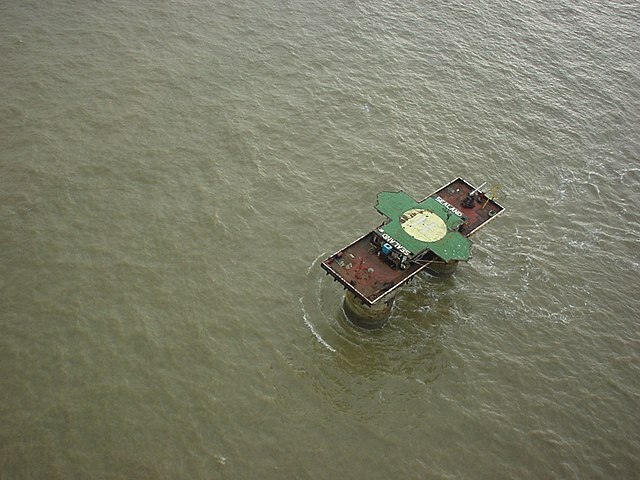 Another obstacle to Sealand’s sovereignty is the fact that it’s a man-made structure, and would therefore not constitute an island. However, that has not stopped its government from continuing to assert claims to the territory. The current ruler is Prince Michael, the son of original founder Paddy Roy Bates, who died last year. They issue stamps, passports, and even money. And in case you were wondering how this micronation could afford to survive, they have had a number of commercial endeavors, such as hosting an offshore internet data haven and running an online casino. All this despite the fact that the nation basically consists of one building. Good luck to you, Sealand, and all those other micrnonations out there! In the words of the Sealand motto: E Mare Libertas!